My first blog post was…well…bland and read like a school paper than an informational blog post. But, you know what? I loved it! I loved blogging and I learned over time how to create a blog that people loved to read. 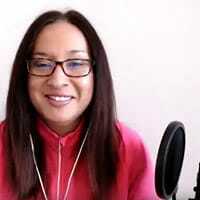 So, let’s go over some tips that can help you connect with your audience better, help you grow your traffic and make more sales! One of the first things I noticed when I started reading other people’s blogs was how they were formatting their blog posts. Many of them had very short paragraphs, they used lists, images and bolded key phrases. I also noticed how they structured their blog posts and this helped me form my own way of writing a blog post. Let’s go over the format and then we can cover the actual writing to attract readers component! Your headline is probably one of the most important pieces of copy in your entire blog post. Because that is usually what people see on social media. In a split second someone scrolling through Twitter or Pinterest or Instagram will see your headline and make a decision to stop and read or keep on scrolling. Your headline can also help you rank in Google. You do this by optimizing your blog headline with keywords. But, SEO is an entirely different mindset from writing a blog post as a new blogger. 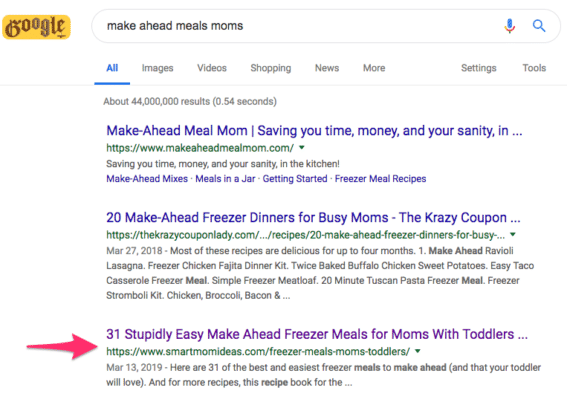 I didn’t focus on SEO for the first year of Twins Mommy – but that didn’t stop me from ranking in Google. If you want to learn more about using SEO (keywords in particular), check out my post on the first step to SEO. Another thing about your headline is that you can have an entirely different headline for social media than what you have for your blog post. As you can see, all these headlines focus on a problem and how to fix that problem. I also like to “call out” the audience I’m attracting (moms, new moms, pregnant moms etc..). Focus on those elements when writing your headlines. The only part you need to know about your blog introduction is the first sentence. If you can hook a reader in the FIRST sentence, they will read the second sentence. And if they like the second sentence, the will read the third, and fourth and so on. So, your goal as a new blogger is to hook your reader from the very first sentence. As a copywriter, I learned that bucket brigades are a great way to start your blog post. Essentially, a bucket brigade is a partial thought or idea and it makes you HAVE to read the second sentence. You read Glen’s first sentence and you have to read the second sentence. Glen does a great job to lead you down this introduction by “teasing” the reader and slowly unraveling his topic. This process takes practice but, an easy “hack” is to ask a question. I often do this for my introductions. If I can get a reader to nod “yes” with me, then they are more likely to keep on reading. So, try asking a question as your first sentence. The body of your blog post is the “meat” of your entire blog post. It’s why someone clicked over to read your content. If you want to write an amazing blog post that’s in-depth and really helps your audience, it will take you time to work out. 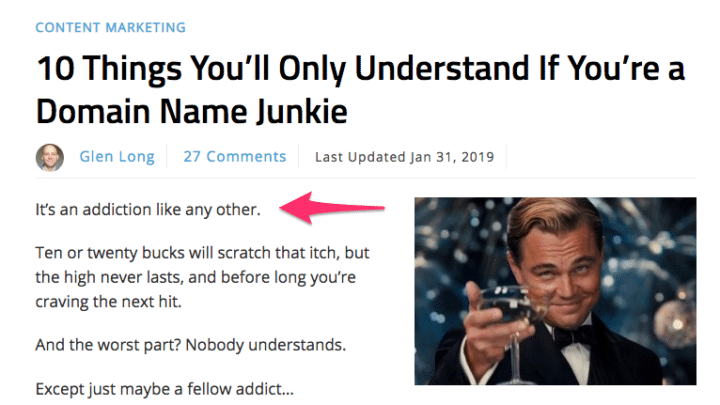 I highly suggest that if you’re a brand new blogger, to skip this method and work on a shorter blog post – 1,000 words – that is highly helpful. In the body of your blog post, use subheadings (like I am using for my blog post). This makes it super duper easy for a skimmer and reader to know what they are going to learn. You also want to write shorter blog posts – 2-3 sentences – to make it easier for people to read your blog post. Finally, try to add a list here and there to break up your text! As a copywriter and freelance writer, my clients pay me for a complete post. And this means having a formal conclusion. Your call-to-action is what you want your audience to do in return. Do you want them to engage in conversation? If so, end your conclusion with a question so that when people comment on your blog post, they can answer it. Do you want people to sign up to your email list or buy your product? Make sure to have graphics, buttons or optin forms at the end of your blog post. Finally, do you want your readers to share your blog posts? Make sure you have enabled social sharing buttons for that! Okay! So that is the format of how a blog posts should be written, but how do you write up an engaging blog post that gets read? Let’s go through how to write a blog post for your readers. One of the first things I do during this process is to come up with blog ideas. I need to figure out what to blog about and sometimes that’s a struggle. 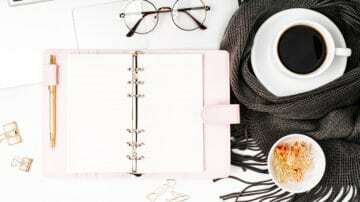 Even though I’ve been blogging for almost 5 years now, I lose creativity or I get writer’s block and trying to come up with a blog post topic is hard. For example, this blog post topic was hard to come up with. I write a lot about writing a blog post, and I don’t want to come off as redundant. I also want to provide value and sometimes that means writing long form blog posts. Let’s go over six things to think about when writing your blog post. The first thing is having a place to jot down your blog post ideas. I like to use my bullet journal for this. I also use post-it notes and I sometimes just add them to Evernote if I’m online and focussed. Coming up with blog ideas usually happens when I’m on Pinterest or Facebook. I read other people’s blog posts and that might inspire me to come up with a topic. But, lately that’s been getting harder for me. Especially for my niche blog – Elna Cain. So, for my niche blog, I have to rely on chatter. Chatter in my Facebook group or on my email list. This can help me figure out the right topic for my audience. So, do what works for you when figuring out your ideas. It’s important to create an outline of what you will talk about. I typically do that inside WordPress. This helps me figure out the length of the blog post, how much information I need to write about and jogs my memory if I decide to work on other projects in the interim. Each point in my outline is typically a subheading or part of a larger subheading. Okay – this is pretty important. It’s right up there next to your headline. According to Neil Patel, there are over a billion blogs today. [W]hen I first started with content marketing, there were less than 30 million blogs that existed and now there are over a billion. You have to stand out as a blogger. Your content needs to stand out and hook readers. I don’t want you to feel deflated after hearing this. It is totally possible to carve a place online. 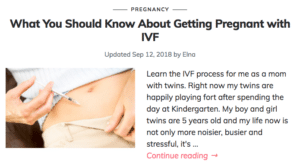 I was able to do it with Twins Mommy and the niche I’m in – blogging about blogging. 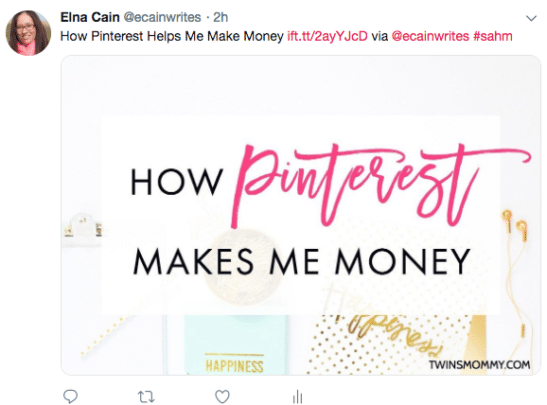 This niche is highly highly over saturated, yet Twins Mommy ranks #1 for several keywords, I have an engaged email list and this blog makes money. And that happened, because I shared my story. I was authentic and helpful. By sharing who you are, you start turning your blog into a brand. And brands will outlive blogs any day of the week. When I think of cooking, I immediately think of Minimalist Baker (brand). If I want to learn about Pinterest marketing, I’ll go to Tailwind (brand). Creating a brand around your blog takes years, but it all starts with a story. Share your story and connect with your audience. I know I have a lot of twin moms reading my blog posts or are in my Facebook group or on my email list. I also know I have a lot of freelance writer moms too commenting on my posts! Do you HAVE to be that personal on your blog? Not necessarily. Smart Mom Ideas is another blog I own, and I don’t have an email list or products on that blog. But, I occasionally share my story. This builds trust with my Smart Mom Ideas audience. So, as a blogger, find a way to share your story – with your About Me page, blog voice, or emails – as a way to help serve your audience better. When writing your blog post, pay attention to your audience. When you do this one thing, you suddenly turn a blog-centric post to a reader-centric post. You are talking to your audience when you write your blog post. Sure you can use “I” when sharing your story or talking about you, but try to make most of your blog post about your readers. 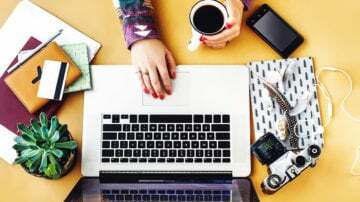 Blogging for money isn’t a personal diary account. But, it can incorporate YOUR strategies and tips to help others in your niche. An easy way to pay attention to your audience is to incorporate them in your headline. I call out “moms with toddlers” in that headline. This immediately makes me focus on moms with toddlers when I write that blog post idea. To write a blog post, you need your full attention. No multi-tasking and no interruptions from life. Now, as a mom – stay at home mom – this is a huge tall order to accomplish. My husband also works from home and we constantly “bug” each other with our text messages. And I can never write a blog post when my twins are home. Before they went to school, I only wrote when the house was quite (nap times or bedtime). For me, to minimize distractions, I listen to music when I write to boost my productivity and creativity. Over the years it’s changed – from modern classical music to listening to JLo or Ariana Grande. I wasn’t a very fast typer when I first starting blogging. I had to practice by typing every day and by taking typing tests. Remember, as a freelance writer, it is a good idea to be able to adeptly and swiftly type so that you can make more money (i.e. 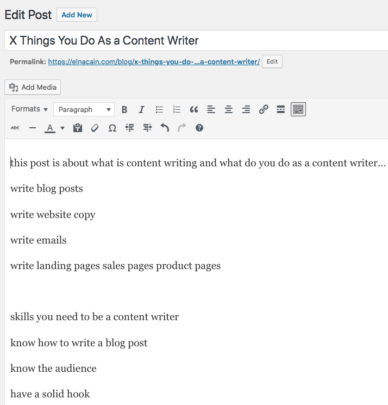 write 3 blog posts a day rather than 2). When you can adeptly type, you won’t make as many spelling mistakes and you can write up that blog post when your little one naps for 45 minutes! 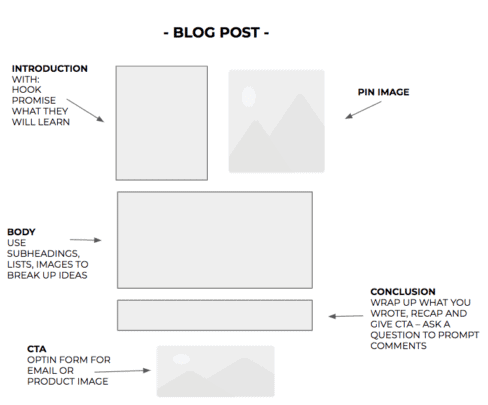 Some proven and actionable tips to help you write an amazing blog post. Remember, it’s okay to start with only one blog post when you launch. 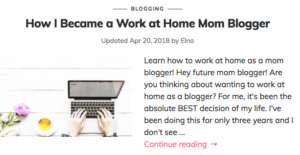 I did this for all of my blogs and look where they are now! Take time improving your blog writing, sharing your blogging voice and you will attract an engaging audience that wants to learn from you! Over to you – what’s the one thing you know you need to improve to write a better blog post? Please remember to share this! I’ve once made a graphic for my social media: 15 questions to ask before you publish anything. One of them was “how many times someone talked about it”? I think that when you’re trying to write a better blog post, the biggest challenge these days is to write a post that isn’t a copy of something already posted. I mean, how many times have I read an article only to have a feeling that I’ve already seen these ideas discussed elsewhere? It’s so important to me to at least try and go beyond the most basic and obvious points! While that’s true, it’s not necessary. This blog post I wrote is on tons of blogs out there but it’s my angle and my view that make it unique! So for moms that want to blog, don’t stress about making it totally unique. Everything has already been written. So form your brand and your identity and your audience will listen! Hey Elna! Thanks for these great blog post tips! I started my blog last year, then got totally overwhelmed and quit. Now I’m giving it another shot and trying to figure out what kinds of blog posts to incorporate. Having an outline before I start writing is definitely something I plan to use in my blog post strategy this time around! That’s great you found some inspiration to start writing blog posts again! Yes, I was in a funk – well still am – and writing is hard for me lately! Hang in there and try different things to get re-inspired! One of the things that make your blog sticky is your formatting; short paragraphs and sentences. This actually makes it comfortable to read through. 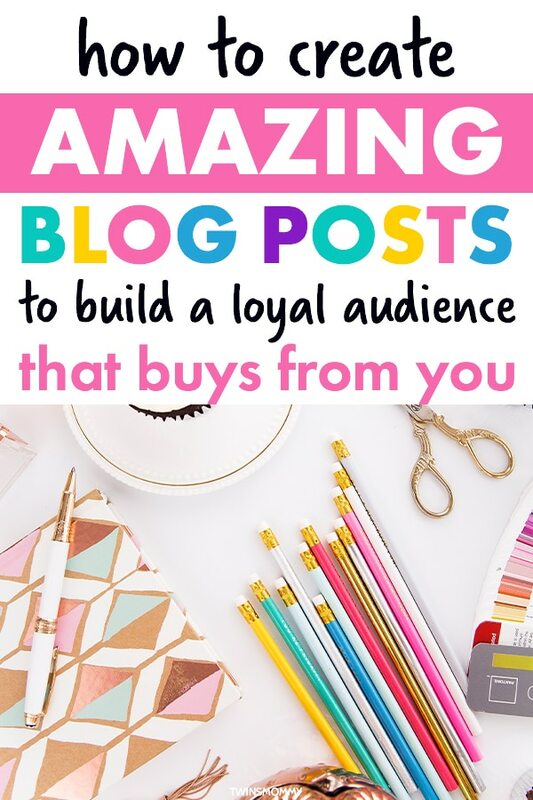 Thanks so much for your blog tips for writing a blog post! yes, making your blog stick regarding format is important. It really helps readers stick to reading the entire post! At least for me. Thanks for stopping by! Great post once again with a lot of tips to implement. I always find to finish my blog post as a no ending saga & ultimately got frustrated. But the trick to outlining first and then treating outlined heading as subheading is totally brilliant. I also glad you provided a visual layout for a perfect blog post also. As always your article is a great helper to me. Thank you so much! Yes, I like having visuals to how to write a blog post too! It really helps me formulate my own outline for blog writing. I’m so glad you found a remedy to your conclusions! Those are sometimes tricky for me too! Such great tips here, I especially love your thoughts on headlines and intros. Those are two areas I definitely need to work on! Thank you so much! You’re an amazing writer too mama! Glad you found some tips to help you with your headlines and intros!